New Crash Test Dummies. IDT Cameras show new dummies in action. PMG in Montreal is a test facility for the Canadian government. All cars purchased in Canada must pass safety testing done at PMG. The following video was shot in 4K by Canadian television (the equivalent to Discovery) to highlight PMG and crash safety. You will see in the video our cameras NXA-3 they currently use but are upgrading to OS9. What is very impressive is the image quality of the NXA-3 cameras against the 4K footage shot with broadcast cameras, everything at first glance looks like it was shot with the same cameras. You’ll also see some footage shot from very old high speed cameras that are being replaced by IDT cameras shortly. This programme is in French. However, it’s an interesting watch even if your understanding of the french language is as limited as mine! “In general they use crash test dummies (mannequins) in order to understand better all body movements and modifications during impact, especially for those who are seated in the same car with driver. They very carefully measure body, leg, and arm positions. They try to create crash test dummies closest to the human body to get the most realistic results to compare. In the ’60s they used mannequins-robots. This industry (human protection in car crash) had minimal research and too many deaths. In the ’70s they created Hybrid family and to date they are using the 3rd generation during crash tests. The target is not only to minimise the number of deaths, but also minimise the number of severe injuries occurring in accidents. 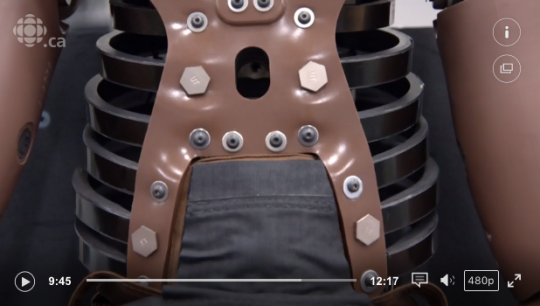 This video introduces the new crash test dummy Thor. As they say, the difference between new one and the Hybrid family is like day and night:) It gives 3 times more test result information for speed, movement and strength than Hybrid. Thor has accelerators installed in its head which help to see rotational movements. It also has sensors installed in the legs and feet to obtain results in movements closer to the human body’s. As you can see, before they do the crash test, they perform a sample test to see how the crash test dummy responds.They call it a pendulum test. The criteria for this crash test were: front impact with 56km speed, 40% angle. They had Hybrid family in one car and Thor in another one in order to analyse the video footage and compare. They also wanted to test Thor to see if it could be adapted for future testing; even though it had already had several different tests in laboratories. Once IDT’s NR-3 cameras were set up at the correct angles (many of them on the bottom to record feet movements), they were ready for crash test! Right after test the first thing they did was to examine the cars. After that they checked final body positions and together with video records, they can analyse and interpret the results of movements. They pointed out that old generation mannequins had straight back with minimum flexibility. The feet movement on old ones only showed how feet moved from pedal and that was it. Thor records show not only where the feet were moved, but also what happened to the feet themselves. By analysing this video, they see the direction of the forces etc. They are trying to minimise number of injuries and in the future want to innovate protective airbags on the bottom. 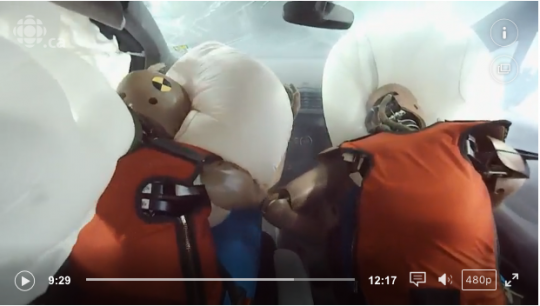 Another thing is that they need to develop the production of such flexible crash test dummies like Thor in order to analyse what is happening to the passengers on the back seats. Usually on the back seats we use a more relaxed position, resting in the corner of the car etc. New generation of mannequins will give the opportunity to improve this kind of research especially in situations with cars of the future (autopilot cars); when people will be seated facing each other or in totally different positions, more relaxing and less focused on the road.